The idea of play has always stayed with me, and I imagine with you also. It's because we're gamers, as I don't think gamers ever truly leave behind the concept of play. Back in the day, outside my house was a huge green hill. We called it “the hill”, naturally. During summer and before our estate hired a tractor to come and cut it, the grass grew incredibly high on that hill. Even if I stood next to it, it would almost be up to my shoulders at its maximum height. When we were kids we'd take all of our G.I Joe figures, lay down in the grass and start to army crawl around blindly. The game was simple: whoever you happened to meet in the grass as you crawled forward was your enemy, which meant an epic G.I Joe battle had to ensued. Though it may have not been with plastic toys any more, that sense of play continued on into my gaming life. Whether it was hunched over a Gameboy, collecting gems in Spyro the Dragon, stacking remote mines on top of each other in bathroom in Goldeneye 007, hunting for food as Naked Snake in Metal Gear Solid 3: Snake Eater or collecting every book across the land in Skyrim, it's still the same idea as when we played in the tall grass as kids. This latest review deals with a game that is the very definition of play, and while it may not be perfect it's a game that is so inviting, comfy and lovable that it's kind of hard to hate. 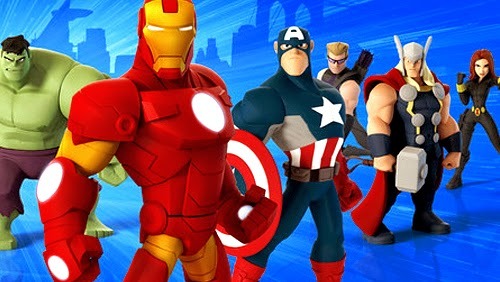 Developed by Avalanche Software and out now for iOS, PlayStation 3, PlayStation 4, PlayStation Vita, Wii U, PC, Xbox 360 and Xbox One comes Disney Infinity: 2.0 Edition - Marvel Super Heroes, a game that the whole family can enjoy. Disney Infinity 2.0 is the sequel to 2013's Disney Infinity, the sandbox adventure game that placed you in the shoes of some of Disney's biggest heroes, such as Captain Jack Sparrow from The Pirates of the Caribbean and Sully from Monsters Inc. However, this latest instalment takes the term “heroes” to new heights, as Disney Infinity 2.0 introduces some of Marvel's biggest superheroes into the mix. In case you're unaware, the Disney Infinity franchise is very much reliant on additional purchases beyond the actual game. They come in the form of new characters and play sets, which are essentially new story campaigns. It's basically the exact same as the concept behind regular DLC, but instead with Disney Infinity you get some pretty nifty toys instead of a code. Depending on which play set you use during gameplay, as of right now there are three main campaigns to undertake. First there's The Avenger's play set, which pits Iron Man, Captain America, Black Widow, Hawkeye, Thor and Hulk against Loki and MODOK, who are trying to bring about the destruction of Earth with the help of the Frost Giants. Then there's the Spider-Man play set. Inspired by Ultimate Spider-Man, this play set puts you behind the mask of the famous web slinger himself as some of his greatest foes attempt to clone the Venom symbiote. Finally there's the Guardians of the Galaxy play set, which has the guardians once again go up against Ronan the Accuser, the Kree fanatic that was recently seen in the blockbuster film. However, it must be said that if you're buying the starter pack (which only includes The Avengers' campaign), to truly get your moneys worth you'll need to invest into the other available play sets too, as there just isn't enough in the starter pack to keep you coming back for more. Having said that and having tried all three play sets, I must say that gameplay remains quite similar across each adventure, which usually falls into three categories- exploration, puzzle solving and beating up bad guys. Even then gameplay is incredible basic, with combat often being nothing more than an exercise in button bashing with very little skill involved at all, despite the game featuring an impressive skill tree. It's not all doom and gloom though, as there's something about its simplicity that kept me coming back for more. It brought me back to my days of getting stuck into Spyro the Dragon. Back then I didn't care about graphics, I didn't care about achievements and I didn't care about being challenged. I just cared about having fun, quite simply. The gameplay in Disney Infinity 2.0 will not put your gaming skills to the test, but it will certainly entertain. However, play sets don't make up the entire Disney Infinity 2.0 experience, as Toy Box mode is also available for all your creative needs. Essentially Toy Box mode allows you to create your own world, from decorating your home with posters of Iron Man, to building your own epic tree-house hangout for The Avengers themselves. Through playing the play sets you'll find countless items that you can then use in Toy Box mode, which is a far more enjoyable, fun and rewarding experience than the main game itself. Overall Disney Infinity 2.0: Marvel Super Heroes isn't for everyone. On one hand it's incredibly simplistic, shallow and very much an experience you'll sink money into, but on the other hand it's fun, a celebration of all things Marvel and an ongoing adventure that the entire family can enjoy. Seriously, this is the perfect game for the family to sit down on Christmas morning and enjoy together. Personally, it reminded of the simpler days of being a gamer, which despite its many flaws, makes for some wonderful gaming moments and memories. Disney Infinity 2.0: Marvel Super Heroes goes to infinity and beyond with a 4/5.